Spero che vi venire a godere la nostra casa accogliente e luminoso, situato su 4 acri sereni, nelle spettacolari del Sud Isole del Golfo. Il cottage è ben arredate con concetto aperto soggiorno, pranzo e cucina. Ha una camera con letto matrimoniale e al piano superiore troverete un loft molto accogliente con due letti singoli. Ma è probabile che spendere molto del vostro tempo sul ponte spazioso, piacevole in qualsiasi periodo dell'anno. L'estate è sole inzuppato tutto il giorno grazie alla nostra esposizione sud-est. Autunno, inverno e primavera hanno il loro fascino speciale, con serate passate davanti alla stufa a legna godendo di un buon libro, giochi da tavolo, o la quiete dell'ambiente circostante. Godetevi il ritmo sereno del cottage o mettere le scarpe a piedi per godersi le numerose spiagge e sentieri delle isole hanno da offrire. Mountain bike, kayak, vela, golf, e molte altre attività sono nelle vicinanze, come è il bellissimo Poets Cove Resort and Spa, dove si può godere di una cucina raffinata, trattamenti termali, nuoto e molto altro ancora. In estate, il mercato Sabato agricoltori è da non perdere e sarete stupiti dal talento e la creatività dei nostri numerosi artigiani. Come pure, Pender Island ha molti comfort e servizi per offrire tutto ciò che potrebbe essere necessario per il vostro soggiorno. The cottage is everything it claims to be. It is set in a little clearing surrounded by trees. Deer graze on the grass right in front of the cottage, but fade into the trees when you make an appearance. The little house of Hansel and Gretel must have been like this. Sure enough there is the ocean clearly visible through a gap in the trees. You can feel the ocean in the air before you can see it. The interior of the cottage is consistent with its exterior, which is to say traditional. There is everything a person could need. The house is seriously clean, and this, I believe, makes it easier for the visitor to keep clean. The double bed was so comfortable I could have taken it home with me. The WiFi worked perfectly. The cottage is set down from a road that culminates at a point, a good place to witness the power of the ocean. From this road you wouldn't know the cottage was there. On this road you could walk without being disturbed by much traffic. Regards the traffic everyone heeds the speed limit of 30 mph. Immediately it has a calming effect. It is worth noting that this not like being in a city. This is a real community made up of real people. They know each other. I saw Brigette only once, on my first evening. I had a minor calamity with my car and she came out to make sure I was ok. This is indicative I think of her willingness to help out if needed. Otherwise she stays in the background as a good host does. She was not at all obtrusive. From my few minutes conversation she seemed an agreeable person and good company. In short, if you're interested in booking this cottage I would encourage you to do so. I hope to return. This is our second time staying at this cottage. It's quiet, clean and as a family of 4, has everything we need. We will be back! This cottage looks even better in person. It is just perfect. The kitchen is very well stocked, the furniture is new and there are so many cozy pillows/blankets. Me and my girlfriend stayed in the winter and the cabin was so warm especially with the wood stove going. Brigitte was incredibly attentive always making sure we were fully stocked. There are so many personal touches its easy to see she goes out of her way to make you feel invited and at home. There are tons of great hikes nearby! My wife and I had a wonderful time relaxing in front of the fire, and enjoying the peaceful environment at this cabin. The huge windows are great for winter stargazing, and there are good hiking trails within walking distance of the cottage. We'll definitely be back! 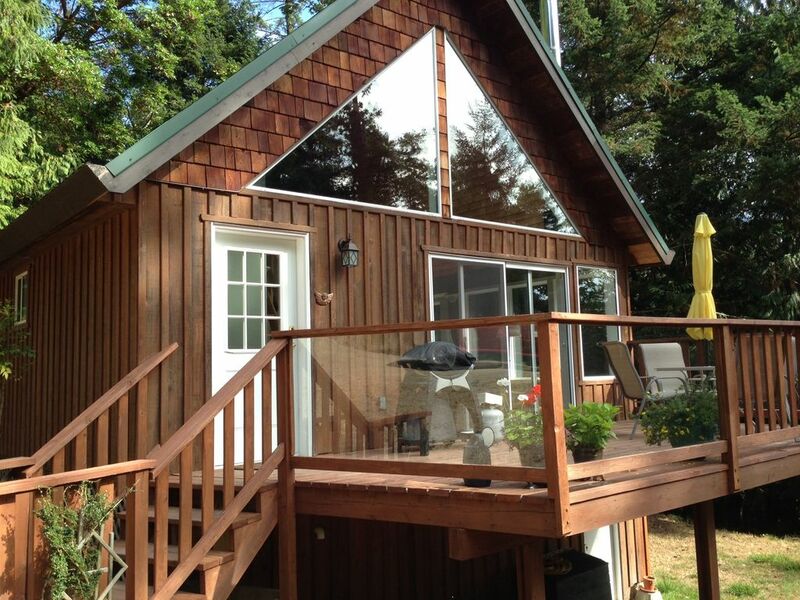 Family holiday on Pender Island at the end of November and Brigitte’s cottage suited us perfectly. Peaceful location, cosy evenings by the woodburner, bright and light when the sun shone. We enjoyed walking the trails through the woods, up the hills and along the beaches - as did our dog, although she was a bit upset when deer wandered through what she considered to be her front yard! Brigitte was helpful and was waiting for us as we arrived in the dark - the drive is quite steep and dark on Pender is dark. Great trip, hope to return. Quiet and secluded. Perfect for a reclusive couple. Cleaning fee of $75.00 for more than 2 guests. Pet fee of $75.00.